Visible in the construction cranes and towering steel frames that increasingly dot Los Angeles’ landscape, one thing is clear: construction here is booming. 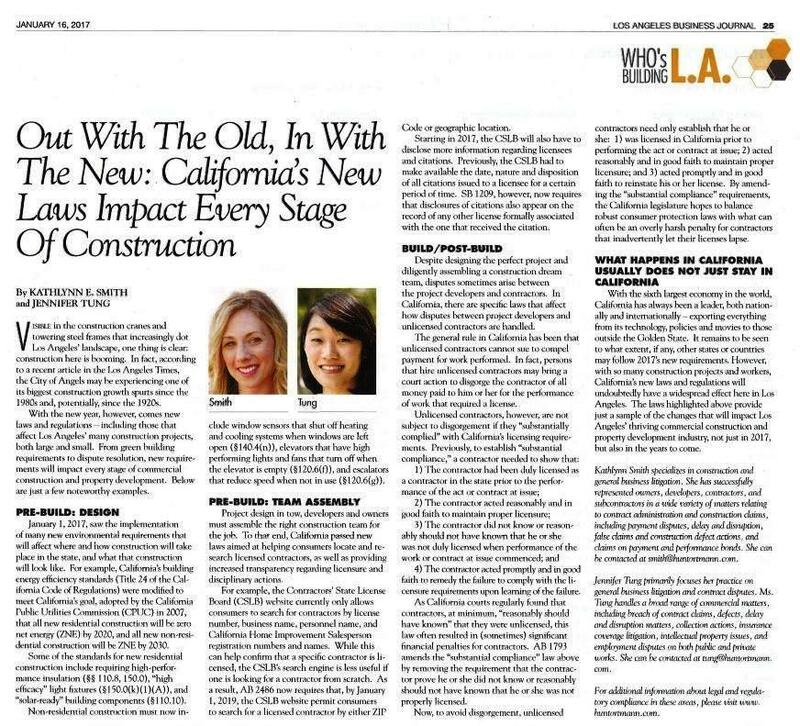 In fact, according to the Los Angeles Times, the City of Angels may be experiencing one of its biggest construction growth spurts since the 1980s and, potentially, since the 1920s. With the new year, however, comes new laws and regulations – including those that affect Los Angeles’ many construction projects, both large and small. From green building requirements to dispute resolution, new requirements will impact every stage of commercial construction and property development. Below are just a few noteworthy examples. January 1, 2017, saw the implementation of many new environmental requirements that will affect where and how construction will take place in the state, and what that construction will look like. For example, California’s building energy efficiency standards (Title 24 of the California Code of Regulations) were modified to meet California’s goal, adopted by the California Public Utilities Commission (CPUC) in 2007, that all new residential construction will be zero net energy (ZNE) by 2020, and all new non-residential construction will be ZNE by 2030. Some of the standards for new residential construction include requiring high-performance insulation (§§ 110.8, 150.0), “high efficacy” light fixtures (§150.0(k)(1)(A)), and “solar-ready” building components (§110.10). Non-residential construction must now include window sensors that shut off heating and cooling systems when windows are left open (§140.4(n)), elevators that have high performing lights and fans that turn off when the elevator is empty (§120.6(f)), and escalators that reduce speed when not in use (§120.6(g)). Project design in tow, developers and owners must assemble the right construction team for the job. To that end, California passed new laws aimed at helping consumers locate and research licensed contractors, as well as providing increased transparency regarding licensure and disciplinary actions. for a contractor from scratch. As a result, AB 2486 now requires that, by January 1, 2019, the CSLB website permit consumers to search for a licensed contractor by either ZIP Code or geographic location. Starting in 2017, the CSLB will also have to disclose more information regarding licensees and citations. Previously, the CSLB had to make available the date, nature and disposition of all citations issued to a licensee for a certain period of time. SB 1209, however, now requires that disclosures of citations also appear on the record of any other license formally associated with the one that received the citation. Despite designing the perfect project and diligently assembling a construction dream team, disputes sometimes arise between the project developers and contractors. In California, there are specific laws that affect how disputes between project developers and unlicensed contractors are handled. The general rule in California has been that unlicensed contractors cannot sue to compel payment for work performed. In fact, persons that hire unlicensed contractors may bring a court action to disgorge the contractor of all money paid to him or her for the performance of work that required a license. The contractor acted promptly and in good faith to remedy the failure to comply with the licensure requirements upon learning of the failure. As California courts regularly found that contractors, at minimum, “reasonably should have known” that they were unlicensed, this law often resulted in (sometimes) significant financial penalties for contractors. AB 1793 amends the “substantial compliance” law above by removing the requirement that the contractor prove he or she did not know or reasonably should not have known that he or she was not properly licensed. Now, to avoid disgorgement, unlicensed contractors need only establish that he or she: 1) was licensed in California prior to performing the act or contract at issue; 2) acted reasonably and in good faith to maintain proper licensure; and 3) acted promptly and in good faith to reinstate his or her license. By amending the “substantial compliance” requirements, the California legislature hopes to balance robust consumer protection laws with what can often be an overly harsh penalty for contractors that inadvertently let their licenses lapse. With the sixth largest economy in the world, California has always been a leader, both nationally and internationally – exporting everything from its technology, policies and movies to those outside the Golden State. It remains to be seen to what extent, if any, other states or countries may follow 2017’s new requirements. However, with so many construction projects and workers, California’s new laws and regulations will undoubtedly have a widespread effect here in Los Angeles. The laws highlighted above provide just a sample of the changes that will impact Los Angeles’ thriving commercial construction and property development industry, not just in 2017, but also in the years to come. For additional information about legal and regulatory compliance in these areas, please visit out Los Angeles Construction and Business Attorneys today by scheduling a consultation. Los Angeles Times, “Downtown Los Angeles hasn’t seen this much construction since the 1920s,” January 8, 2016. Kathlynn Smith specializes in construction and general business litigation. She has successfully represented owners, developers, contractors, and subcontractors in a wide variety of matters relating to contract administration and construction claims, including payment disputes, delay and disruption, false claims, construction defects, and actions on payment and performance bonds. She can be contacted at smith@huntortmann.com. Jennifer Tung primarily focuses her practice on general business litigation and contract disputes. Ms. Tung handles a broad range of commercial matters, including breach of contract claims, defects, delay and disruption matters, collection actions, insurance coverage litigation, intellectual property issues, and employment disputes on both public and private works. She can be contacted at tung@huntortmann.com.